TNT is a forward-thinking network. First they picked up the sci-fi series Falling Skies, which comes from executive producer Stephen Spielberg. Science fiction can be expensive to produce so we don’t see nearly enough of it on television. Only a few episodes of the show have aired so far, but it’s already been picked up for a second season. 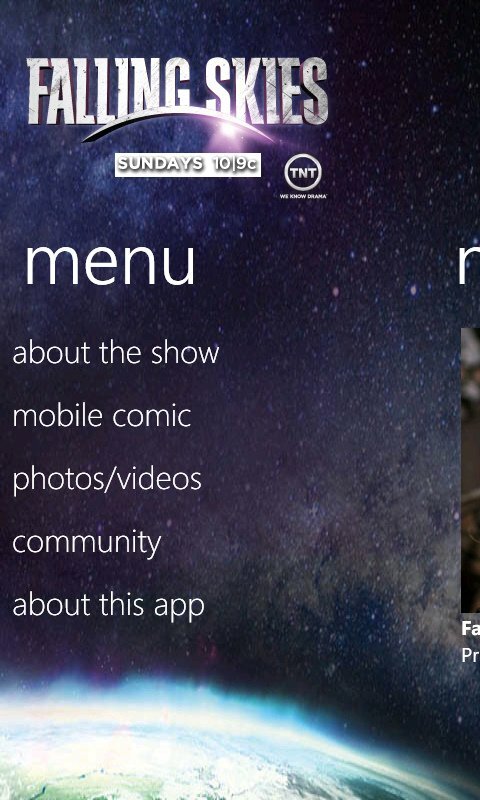 Further showing support for the show, TNT has also released a companion app for Windows Phone. It comes to us from Chaotic Moon Studios, the developers of numerous official apps like Best Buy and FlightAware. Before we talk about the app, let’s touch on the show itself. Falling Skies takes place six months after a malevolent alien race has conquered the earth, killing most of the human population. A group of freedom fighters, the Second Massachusetts, struggles to push back the invaders while protecting as many civilians as possible. These defenders include the protagonist Tom Mason, a former history professor (played by Noah Wyle); his teenage son Hal Mason (Drew Roy); Captain Weaver (Will Patton) – the military leader of the group; and Anne Glass (the always attractive Moon Bloodgood), a pediatrician-turned-medic. The show features plenty of action and intrigue. Occasional sappy moments, mostly involving Tom’s youngest son Matt (Maxim Knight) may induce groans, but they’re largely overshadowed by the better bits. Head past the jump for our full review. The Falling Skies app, like you might expect, is designed to deliver content from the show’s website in mobile-friendly form. As a result, the app requires an internet connection to use. This has several advantages: it keeps the file size of the application down, and it allows for the addition of new content without updating the app itself. That doesn’t mean the app shouldn’t be updated, but we’ll get to that in a moment. 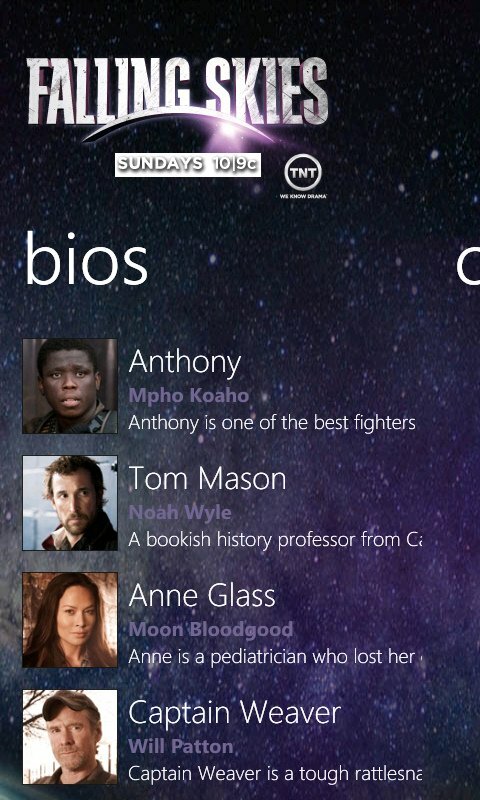 Falling Skies on Windows Phone contains the following sections: About the show, Episodes, Bios, Comics, Photos, Videos, and Community. Let’s look at the contents of each section. About the show, Episodes, and Bios: Each of these pages includes a single photograph and text for fans looking to learn more about the show. The Episode descriptions are updated as new episodes air. They tend to be brief, but do help readers keep track of what episodes they’ve seen or missed. Bios describe the principal characters (11 so far) and name the actors who play them. Filmographies would have been appreciated, but aren’t really necessary. Comics: Read the 64-page webcomic on your phone. Given that the series pilot starts 6 months after the first alien attack, there’s a fair amount of prequel ground to cover. The webcomic tells part of the story, with the rest supplied outside of the app via a trade paperback. Just don’t expect to learn anything new about the skitterers (aliens), as that information will be slowly drip-fed within the show itself. 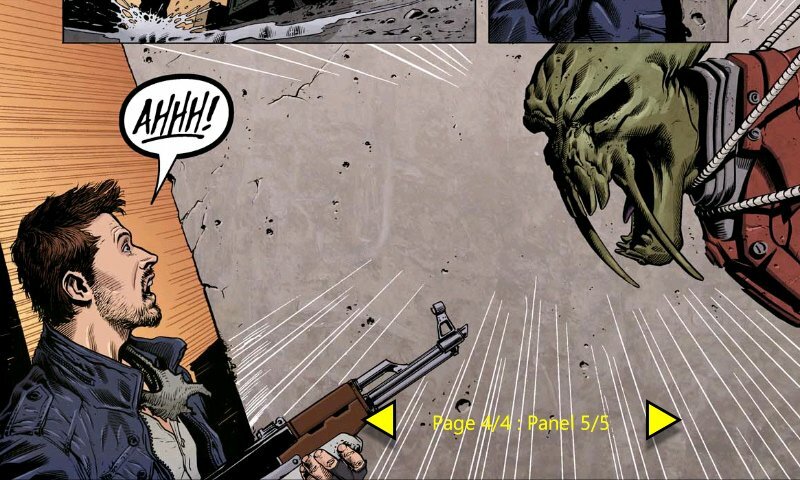 Reading the comic on the phone is a painless process – swiping left or right advances panels, while taping the lower-left corner of the screen toggles between two levels of zoom. Photos: An assortment of 18 images from the show. The app has some catching up to do with the series website, which has many more images sorted by episode. Photos can’t be saved from within the app, either. Videos: Two videos are available at the moment: a special effects featurette and a “sneak peek” at this week’s upcoming episode. Like Photos, the real website contains several more videos than the app. The other content isn’t really missed though. Community: Opens the series’ Twitter page in the phone’s web browser. The app has a nice, clean look that fits perfectly with the Windows Phone Metro UI. Swiping left or right from the main menu and within some sub-menus switches to other pages, as with many apps that are well-optimized for the platform. When the user taps an image from within the Photos section, there’s a nice zooming animation as the photo fills the screen. On the downside, the menus can be a bit convoluted. The main menu lists several options for users to jump into, but others (like Bios) can only be reached by swiping left or right. Comics are presented in a particularly awkward way. If you tap on the words “mobile comic” from the main menu, it simply opens up the first chapter of the webcomic. The end of the chapter doesn’t lead to the next chapter, so one could easily think the app doesn’t have the other chapters. The chapter menu does actually exist, but you have to swipe left or right from the main menu to get to it. It would make much more sense for the main menu link to go straight to the chapter list instead of the first comic. Finally, the text portions of the app could use some refinement. Every such page displays a photograph at the top of the screen, with text relegated to the bottom third of the screen. Scrolling the text doesn’t move the photo out of the way, so the actual readable area is annoyingly small. Hopefully this issue is fixed with an update. 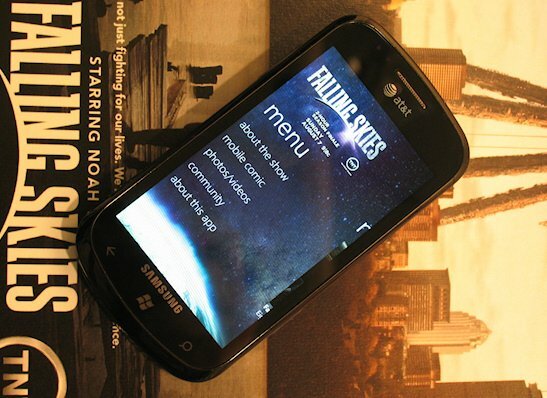 The Falling Skies app does about everything series fans could want in a mobile app. It’s a convenient way to read the prequel webcomic, episode synopses, and character bios, as well as view teasers of upcoming episodes. The only content from the series website that is sorely missed is the ability to stream full episodes of the show. Perhaps the omission is due to a rights issue? If we could watch the show directly from the app, I would easily recommend it to anyone who likes episodic science fiction. As it stands, the app is simply a useful tool for people who watch the show elsewhere to learn more about it on the go. Those who don’t watch the show won’t get as much out of it, but maybe it’ll inspire them to check it out on TV or the web. 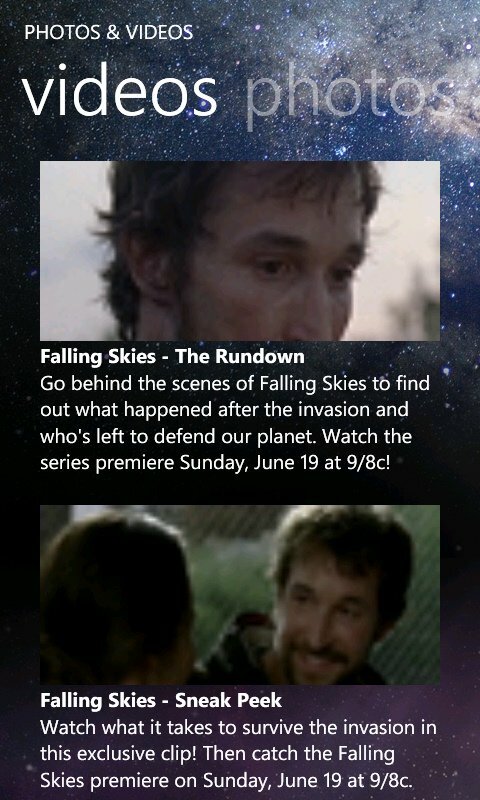 Falling Skies is a free app. You’ll find it here (Zune link) on the Marketplace.